FYI: This may or may not be a new series on the blog. Now, in order to get your clothes made, you either have to DIY (Do It Yourself) or get a tailor to sew it for you. In Nigeria, you can get a tailor to sew a dress easily, and prices range from N2000 ($12.25) to N100,000 ($612.25). The price obviously depends on the material and "level" of the tailor (or should I say designer) you're using. When you move to a different country, it's harder to find a tailor that understands what you're looking to make, and so they come a bit more expensive than you'd like. But what I've noticed with every single tailor I've used, in America and in Nigeria, is that YOU work on THEIR time! Notice what I said. They're providing you a service, but largely follow their own timing. EXAMPLE 2: My current tailor here in Lagos has basically taken my dress hostage!!!!!! It's been 4 whole weeks, and nothing to show for it. When I called him last week, he said he was out of town and would bring it to my house on Monday. THEORY: Tailors all over the world have made a pact to frustrate the living daylights out of simple, innocent folk who just want to look exclusively fly. Lol, you have nice tailors. Nobody has called me to ask where I've disappeared to. I don't sew very often so it's understandable. They are all the same! Mine did that to me as well. I gave her material to sew my matric farewell dress. The matric farewell is like the prom or graduation party for those leaving high school. Gosh, I waited one month. I got the dress on the day of the farewell. AND I watched her sew it right in front of my eyes, 5 hours before the event! 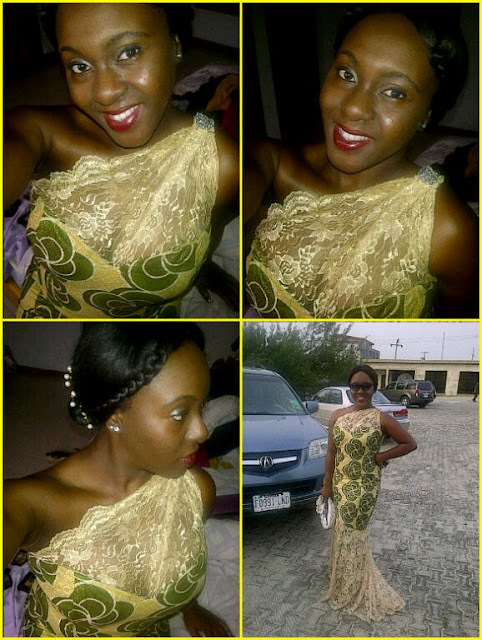 You looked sooo beautiful in that first picture, my word that Jamaican seamstress is so talented! On a semi-related note, can you recommend a good tailor in Lagos. I hate wearing clothes that look 'sewn' if you get my drift. I don't care about deadlines, I just need someone who knows the meaning of a proper finishing. Oh, yes I can. Honestly the finishing is so great, it's almost like buying RTW in a foreign store. His name is Doesn't Exist and he lives in My Dreams. Gorrit? Are you serious? Do good tailors not exist anymore? Maybe I should use all my fabric to do thanksgiving in church or something. 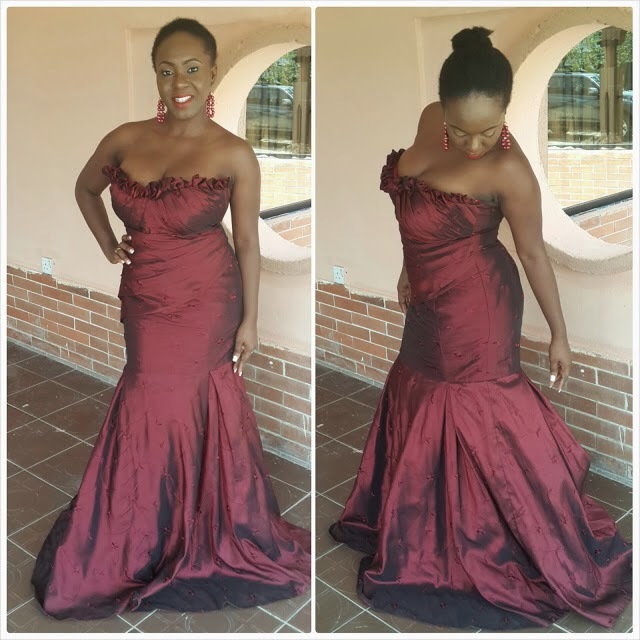 Waoh!that first picture.is she talented or is your figure just fabulous? arggghhh.. My nightmare. I see a lovely dress on someone, get a referral, ask for the exact style and I get something that doesn't even remotely resemble the one I saw. Almost like they gave it to an apprentice to sew. And it happens every single time. As in! You now wonder if you were dreaming when you saw the dress on your friend. Long distance tailoring is even worse. It never ever works out. Kindly send details to me at berrydakara@gmail.com immediately. Thank you for your cooperation. I have a dress with my tailor for my friend's wedding.. Though she was pregnant when she got married, her 2nd child is over 5 now. That's the last time I tried to do Aso Ebi. The lady collected her fees- NGN18,000.00 as I dropped fabric. I don't have my clothes, I don't have my money! The thing about Tailors both abroad and at home is you just don't want to offend them or be harsh with them since they have ones cloth.lol I can so relate to this post...one of my family members just had to let the tailor have her cloth since the tailor never picked up phone..lol even worse...tailor never sewed the cloth. I knowwwwwwwww. It's like they wield this power over you, even though you're paying them for a service. My next Conspiracy Theory post is dedicated to mechanics, lol. I wish I had taken sewing a bit more seriously, so that I could at least make basic tops, skirts and dresses for myself. Thanks! 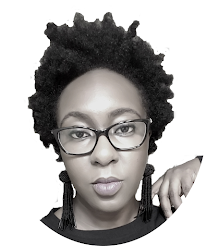 And why'd you stop blogging? 1 year??????????? Does she still have the fabric? Are you sure she's your friend, lol? Once, my sister's friend walked in on her tailor coming out of the bathroom with her fabric tied across her chest as her towel. LOL. I have a tailor that can be categorized as average, but has the poorest character or attitude to clients. Sometime last month, she told me to come for my dress on a Tuesday but I couldn't go, on Thursday I called her to tell her I was on my way to her shop for the dress that I'd love to wear it to work on Friday, she pleaded with me to please wear it to church on Sunday that it will be ready by Saturday. Saturday at 6p.m, Mum Tosin good evening. Ah Eniola what are you here for? I just stood there and shook my head at her. Ah abi, I was the one that told you to come today - rhetorical. I've not made your dress o, let's see what I can do during the week, come on Wednesday you hear? I felt like giving her Madea kind of slaps. No apologies, nothing. A dress I paid for immediately without bargaining for a lower charge. Another time, she made something different entirely from the style I chose despite the fact that I sent a picture to her phone. My fabric as towel?!?!?!? You will pay for that material and keep it! Sorry about your tailor - I can't stand terrible attitudes towards customers. I was wondering if you could give me the info for that Jamaican lady if she lives in ATL. thanks! Hi, her name is Marcia. +1-404-661-8002. She lives in Acworth/Kennesaw. This post made me laugh so hard, everyone has an aso-ebi & tailor near-disaster tale. I'd love to hear from you about this post! Let's all learn and share our worlds. 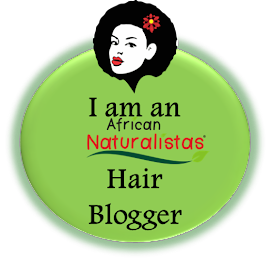 Welcome to my Lifestyle Blog where I share about my life, travels, natural hair and everything in between. CLICK TO GET YOUR FREE COPY OF MY GOAL GETTER GUIDE NOW! Wanna ask a question, invite me to an awesome event, pour your heart out or more? Look what my mum found!!! I'm SICK of this blog!! !